Hey all, not sure if this is the right place to post. Feel free to move if it's not. Buying my wife a newer car. Found a 2015 328i xdrive wagon. 34,000 miles CPO for 23k. Thinking about pulling the trigger tomorrow. Any reasons not to? It would come with almost 20month bumper to bumper BMW warranty. It's in amazing shape, not a scratch on it. Looks brand new. Has heated seats, auto dim mirrors, panoramic sunroof, navigation. The only thing it doesn't have that would be nice are sport seats. Not very familiar with xdrive. Haven't been able to find too much negative via the interwebz. Wondering what you all think? Thanks! Last edited by phillipjfry; 02-02-2019 at 09:06 PM. That sounds good to me. I drove a F30 sedan AWD some months ago, I could not tell a difference compared to my F30 RWD. Keep us posted ! Went in today to buy it. BMW messed up, and it wasn't certified like the dealer said. They offered to "throw in" a one year warranty for $1,600. My wife and I started packing our stuff to leave as soon as the finance guy gave us that generous offer. Oh well, the hunt is back on. Bummer. Oh, well. There's another one out there waiting for you. Ended up with a 2016 subaru legacy 3.6r limited. I was really surprised how much I like the car. I actually really like the sort of generic styling, and the interior is super comfortable. It checked all the boxes but made in Germany..
-the n52 burns at least one coil every 10,000 miles :P. Endless coil replacement. The OP was looking at an F31, not an E91. Well, everything F3X is garbage, so... burn it in a fire. Agreed. I've never been super impressed with any of the F3x cars, whether it was a base 320i or a fully loaded 328i xDrive touring. The 4 cylinder models are just super coarse and unrefined, and they feel more like an economy car than a BMW. The electric steering is straight trash as well. The 6 cylinder models are a lot nicer in terms of the drivetrain, but they still suffer from the generally cheap build quality that plagues all of the F3x cars. I beg to differ. I own a 2015 F33 convertible (435ix) and it is not a trash vehicle at all. It is an impressive ride. Yes, the steering is not stiff like my E46 ZHP convertible. It is not wimpy washy careening off the road because of poor steering feel, either. My F33 gives me plenty of steering feedback. Of course, the reader has to de-rate my opinions on steering feel because of my advanced age (66) and predilection to have my fun accelerating on interstate entrance ramps and not running around curves at places like VIR where steering feel differences are probably more acutely discernible when driving 9/10. The F33 interior build quality is not shabby. Everything is within reach, works as it should, looks good, etc. I design products in plastics (injection, extrusion and rotational molding). I appreciate the complex and practical shapes made in plastics. I'm thinking about compromises all the time such as enjoying short acceleration jaunts to insert into interstate traffic that is not moving over, contemplating how much CO2 my drive is emitting and so forth. While I truly enjoy the more analog experience of my 2004 E46, the F33 is more in step with where my mental arguments are taking me these days. Lighter, more efficient, more optionality (turbocharged engine for more power while burning less fuel at stoplights with the Eco setting). I am expecting to get a heavy flaming from my fellow ZHP owners for making these comments. I appreciate critical comments. Our society needs more thoughtful debates at all levels, including us car enthusiasts. Let's hope they do not take our car ownership choices away from us. Period. Remember Mark Twain's quote: "No man's life, liberty, or property are safe while the legislature is in session." 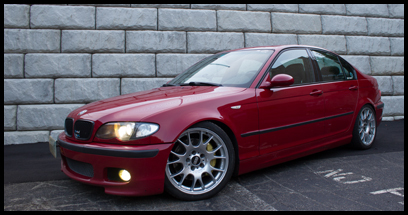 BMW 328i M Sport - receives a new car prep with Opti Coat installation. What do you think? 2007 328i sport wheels on zhp coupe.